One of the biggest problems facing digital natives as they grow into adults is understanding how to maneuver the vastness of the Internet ethically, safely, and to serve their needs. It sounds simple–log on, search, enjoy–but let’s equate this to a shopping mall. You enter the wide, inviting front doors, find the store with the product you need, and then must pay for it. If you don’t have money, you can’t get the product. Even if you could sneak it into your purse, you don’t because that’s stealing (and besides, someone might see you). The concept of ‘buy’ and ‘money’ are often blurry on the Internet but the idea is the same: If you can’t follow the website’s rules to acquire the online product, you can’t have it. If you take it, that’s plagiarism and–like stealing from a store–carries drastic penalties. Me, I don’t want to cheat anyone so when I acquire resources from the Internet, I want to do it legally. That’s why plagiarism checkers are important to me. There are many to choose from but one I recently discovered is PlagairismCheck.org. It requires no installation, is quick and intuitive to use, and covers everything I need at a fair price. per page. School purchases pages for all its members, and members are using pages to run checks. per user. School purchases licenses for users, giving users unlimited access to the software (no page restrictions apply). The goal of PlagiarismCheck.org is not to catch students plagiarizing (though it does) but to help them succeed in their academic ventures. It’s a subtle difference in interpretation but a big difference in attitude and results. One more note: PlagiarismCheck.org is an excellent tool not only for students but for writers, entrepreneurial businesses, and teacher-authors. For the purposes of this post, I’ll concentrate on teacher-student uses. It’s easy to use: Create an account. Upload a .doc, docx, txt, odf, rtf, or pdf by pasting it into the dialogue box or drag-dropping it into the dialogue box. PlagiarismCheck.org quickly checks it against all accessible Internet pages for plagiarism. It looks for an exact match, paraphrased wording, synonym replacement, voice changes, or rearranged words. When the check is completed, you get a report with the plagiarised parts highlighted. This can be saved, printed, or shared (say, with a teacher). The tool can be fully integrated into Google Classroom, Moodle, and Canvas. As a teacher, you can check student results (and sort for easier viewing), review student activity, and check general information about their accounts. Students can upload a file for a check, review a report on a submitted document, and review general information in their account. Owners (those who use the account as individuals) can review account balances and statistics, add members to their account (or delete them), review submitted reports of members, and create folders to organize the account. It helps users who want to legally use online resources. It helps users better understand the line between plagiarized and legal. It keeps a record of your documents so you can track what you’ve checked and/or send it to others interested in the results. It allows you to confidently submit a paper knowing that your research is your original work. Nothing has been inadvertently plagiarized. It provides proof where required that you didn’t plagiarize. Even accidental plagiarizing can cost much more than just a bad grade. 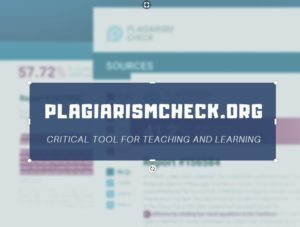 Using PlagiarismCheck.org–with no installation, quick and intuitive to use, and everything you need at a fair price–that’s the answer.